Jose Mourinho has paid tribute to Sir Bobby Robson and revealed he turned down an offer to be his assistant manager at Newcastle in 2000. 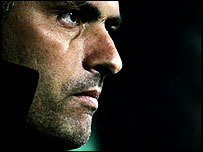 The Chelsea boss worked under Robson at Sporting Lisbon, Porto and Barcelona between 1992-97. In an extract from his biography, in The Times, Mourinho explained: "Bobby lives and breathes the pitch and wants direct contact with the players. "But he knew my ambition wouldn't allow me to accept an assistant coach role." Mourinho, who took over at Benfica shortly after Robson's offer, added: "Since Bobby suspected I wouldn't accept it, he told me it would only be for a year, two tops, and that at the end of that time I would be head coach and he club manager. "But he had forgotten that I had worked with him for many years and so I knew him well. "It is unthinkable to picture him as a manager, watching from the stands. "But I didn't take him up on his offer, knowing sooner or later, my time would come." Mourinho goes on to explain how he utilised the different coaching methods of Robson, and later Louis van Gaal (Barcelona manager from 1997-2000) to help develop his own skills. He added: "Bobby is an attacking coach and his work concentrates mainly on the final part, scoring and, in this case, I tried to take a step back, while maintaining the primacy of attacking football. "I tried to organise it better and this organistation stems directly from the defence. "With van Gaal, nothing was left to chance and everything was programmed in great detail. "All that was left for me was training on the pitch and this meant I improved tremendously because with Robson, I didn't get much practice as a coach on the pitch." Meanwhile, Mourinho insists Chelsea were going nowhere under his predecessor Claudio Ranieri. He told the Daily Express: "Chelsea last won the title 50 years ago so I knew they needed to win things. "But under Mr Ranieri they could win nothing."